Summer is rapidly approaching, with its sweltering heat, endless beach days and scantily clad bodies right on her coattails. For some, this season brings joy and relaxation, but for others the pressure to look good is crippling. People become enthralled in their summer bodies, eagerly desirous to strut their stuff. Or dismayed at their lack thereof due to things like spider veins. From weight loss to skin care, summer is the season for beauty. Some ways to enhance confidence are easily attained, like a new wardrobe or minor weight loss, others can appear fleeting, like getting rid of spider veins. Those unsightly veins easily dampen confidence and send their host hiding beneath layers upon layers of clothing. Having seen many patients going through this, we get it and we want to help! The first thing you need to understand about spider veins is their causes. Understanding the causes will help you understand how we treat them. Spider veins are a result of malfunction in your blood circulation. With time, veins lose their ability to pump blood back to the heart. This is largely due to the one-way valves becoming exhausted and less effective at propelling the blood from the legs up toward the heart. As blood is pulled by gravity, it accumulates in the legs, causing the walls of the veins to deteriorate under the increased pressure. This is what eventually creates those webs of dark blue, red or purple vessels under the surface of the skin. 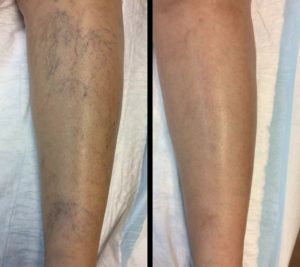 Luckily, spider veins affect the superficial venous system. This means that the veins the closest to the skin are the ones prone to the pattern described above. While this makes them more visible, they are for that same reason easily treated. Ablations and phlebectomies are the most common procedures used to address this issue. The ablation uses heat to close the defective veins, while the phlebectomy uses a very fine hook to withdraw the vein from under the skin. Combined, these procedures will leave your legs looking smooth and beautiful. Ablation and phlebectomies are easily performed at once at a venous disease center. The recovery time is minimal and usually involves refraining from strenuous activity and wearing compression stockings to support blood flow. The removal of spider veins is considered aesthetic and does not remedy a serious medical condition. This makes it unlikely to be covered by your insurance. At the Miami Vein Center, we are fully equipped to address venous diseases of varying severity– from the superficial spider veins to the painful ulcers. Make an appointment today and get your confidence back! Dr. Jose Almeida, a board certified vascular surgeon, whose expertise is renown in the medical field and whose customer service is unrivaled, leads our team of physicians into impeccable customer care.